The biggest sales weekend of the year is here. I have ALL the Black Friday deals and steals, offers, and codes that are available worldwide. This blog and video channel take pride in being as inclusive as possible, so going forward, I will - as far as possible - include offers, products, and so on that ship worldwide. So, no matter where you are around the globe, rejoice - here are ALL the Black Friday codes, deals, and offers that are available worldwide! This year, I'm not doing a bazillion different Holiday Gift Guides - instead, I am listing the best bargain beauty gift sets, again, that are available worldwide. I've divided these into multi-brand, skincare, makeup, tools, and bath and body gift sets, and have also included gift sets for men. Let's make beauty 100% inclusive! By the way, I just found that NuFace gift sets - including the rose gold edition of the device itself - are available for £118, at £40 less, here. You also get a whopping 25% off the LookFantastic Beauty Advent Calendar. More deals are further below. Please note that codes MAY change after Black Friday, for Cyber Weekend, as well as on Cyber Monday, so make sure you bookmark this page, as I'll be coming back here and updating the codes as they change over the whole of Cyber Week. Enough rambling! Let's go jump into all the excitement, for this, right here is your ULTIMATE Black Friday 2018 Shopping Guide! NOTICE: I had not noticed that this post was accidentally published instead of being saved to drafts on Thursday, while it was being written. Thankfully, none of the codes or offers was leaked, BUT you may have seen badly written notes for products and retailer names, which must have made NO sense. The error is regretted. 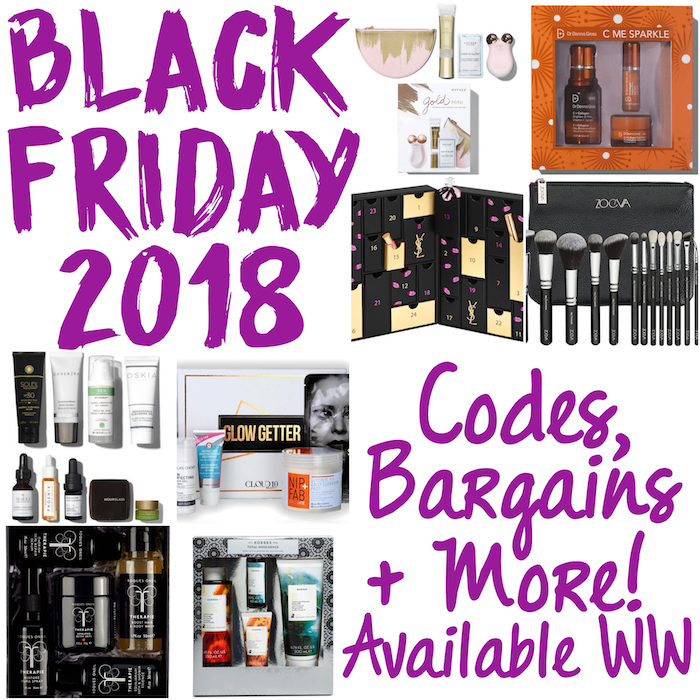 Scroll down for ALL the Black Friday codes and offers available worldwide, and the best bargain beauty gift sets for Holiday 2018. For a quick rundown of offers available, as well as a show of best bargain gift sets - including how much you're saving - do watch this video. I have the codes listed further below. LookFantastic: 20% off with code CYBER. Brand reductions, including on Urban Decay. See them all here. HQ Hair: 20% with code HQCM. Feelunique: Timed Deals, brand reductions, and 3-for-2s on various brands. Code 10EXTRA for 10% off. Wishtrend: GWPs with orders above $99; free shipping plus brand reductions. Code AFFBLACKFRIDAY for another 5% off. CosRx AHA Emulsion is heavily discounted. Escentual: Code BLACK10 gives you 10%, in addition to brand discounts - do check out the Guerlain and Dior! So. What are you going to be buying? Do tell me in the comments' box below. I am going to be treating myself to a NuFace device - something that has been on my wishlist for ages now. It is available with a 25% discount here. I only hope I can wake up in time before the thing is sold out. Expect a bunch of websites to crash, and always prepare backup items in your shopping cart beforehand, as well as backup items to buy the same product - it could sell out in one place! Have fun, and happy shopping!